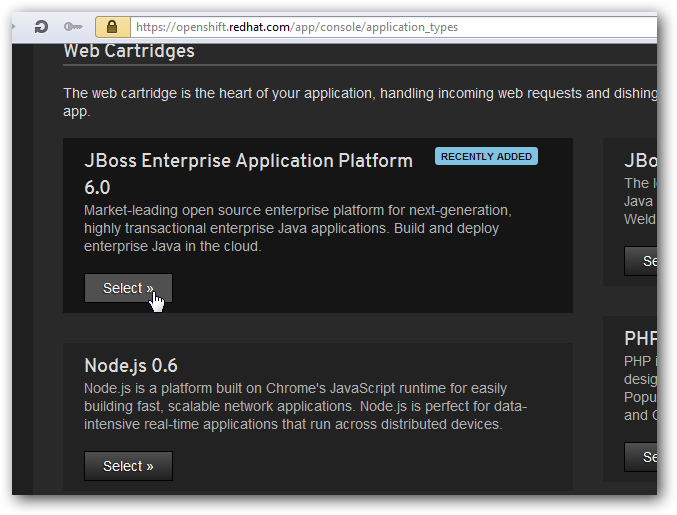 Red Hat OpenShift PaaS has pre-configured one click installers for Frameworks, one click installers for WordPress, Drupal. Free for 50k visitors per month. Condition is going to be very pathetic for the tradition crap web hosting companies. Almost a festive season is now going on to launch free PaaS and one click Installers for WordPress like popular self hosted CMS. We wrote the guide on how to Install WordPress on AppFog Cloud PaaS before. We wrote about Cloud Computing PaaS before. Red Hat OpenShift PaaS is such an example which runs on a Infrastructure as a Service. Those who are more fool, even can not click two or three buttons, you can sell them WordPress, Node.js pre configured and installed just as Software as a Service. Red Hat OpenShift PaaS is a bit different. Ultimate thing is, you have to either directly use that shortcut in console (the screen shot, not the literal meaning of console) to create App or Environment, for WordPress like CMS, that is the final step. But in other cases, as usually you need to use git to deploy your App. This Article Has Been Shared 6145 Times! Cite this article as: Abhishek Ghosh, "Red Hat OpenShift PaaS : Smart Guide to Host Your App," in The Customize Windows, September 28, 2012, April 21, 2019, https://thecustomizewindows.com/2012/09/red-hat-openshift-paas-smart-guide-to-host-your-app/.